Today I'd like to feature a business that can improve the ambiance of any activity. 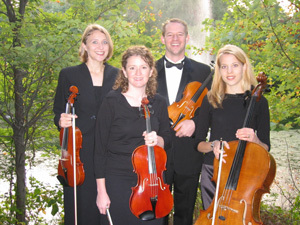 Having a string quartet play background music can add character and and class to any event. String quartets are typically associated with weddings, corporate events, receptions, dinners, and concerts, but they could probably even class up events like Wrestling, Nascar, and Superbowl parties. Okay, maybe it's not for every event. The Briar Rose String Quartet was started by Emily Ricks and it's members are all professional musicians with advanced degrees in music performance. Although they are most frequently asked to play classical music and dress in concert black, they are very versatile and can adjust their dress and music style to create the atmosphere you are looking to achieve. These styles might include classical, pop, swing, religious, or even ragtime. Although classical music is their forte, they have a huge repertoire and styles of classical music that they perform. Since they are all accomplished musicians, you won't be stuck listening to the Pachabel Cannon repeated over and over throughout the evening. Their experience allows them to help their clients plan what music would be most appropriate for their event if they are unsure. Live music performance can make a huge difference in how one feels. It can add class, refinement, and sophistication to an event, which is something we are typically deficient in as a society. If you'd like to make a social event you are hosting more memorable and classy, then you should contact the Briar Rose String Quartet.